I am running Ubuntu 9 as Virtual machine on my home system. Few days back, i installed google Chrome browser on Ubuntu 9. The browser is running great and faster too. But today I experienced something unexpected. When i tried to open adsense in Chrome, it blocked the page saying “The server’s security certificate is revoked!”. I thought that perhaps i mistyped something or its a temporary error. So i refreshed that page and again the same message. I tried to open again after few hours and still the same error. Same error was produced when i tried to open my Avinashtech.com mail which runs on Google Apps. I was able to open Gmail without any problem may be as its not on secured connection (https i mean here). I then tried to open Google homepage with signin ( i.e. iGoogle page). 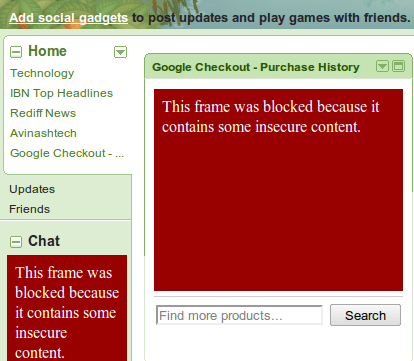 There also i saw that google based portions were blocked saying it contains some unsecured content. I hope this is a temporary glitch or bug and will be fixed soon by google. Or is it just happening with me? Update:- I found the solution atleast for my system. There was some issue with time and data not being updated whenever the system was started. After fixing time and date, the problem is gone. It’s not a system (time/date) problem, it’s a Chrome problem, which Google has no interest in hiring some genuine coders to fix.